Always be safe on the road, CGs. With the passage of Republic Act No. 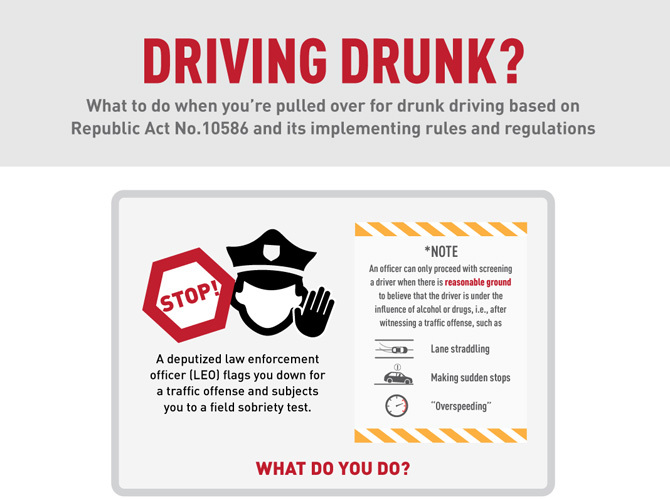 10586 or the Anti-Drunk/Drugged Driving Act, drivers who are caught driving under the influence (DUI) of alcohol or drugs will be penalized accordingly. 1. The police officer can only screen a driver when there is reasonable ground to believe that he or she is under the influence. Traffic offenses include lane straddling, making sudden stops, and overspeeding. 2. You can choose not to take the test, but the officer will confiscate and revoke your license, aside from penalizing you for the other traffic violations you committed. 3. If you agree to take the test, you will be subjected to a Field Sobriety Test. The test includes an eye test, a walk-and-turn test, and a one leg test. 4. If you pass the test, you will only be penalized for the traffic violation you were pulled over for. If you fail, you will be asked to take the breathalizer test to analyze your blood alcohol level. It should be below .05%. 5. If your blood alcohol concentration is above .05%, you will be arrested and your vehicle will be impounded. For more information, check out this infographic from The Official Gazette.